January tends to me one of my favorite grilling months as my attention turns towards recipe that would make one damn tasty Super Bowl party. As much as I love barbecue, I find apps (AKA: appetizers) like potato skins, jalapeno poppers, and nachos even more irresistible. In honor of this, I've decided to dedicate all of my January recipes to my favorite of all the party foods—wings! 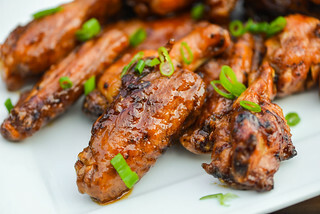 I already have a healthy collection of recipes for wings here that span the standard Buffalo to spicy Cajun to sweet Hoisin to Jamaican Jerk. 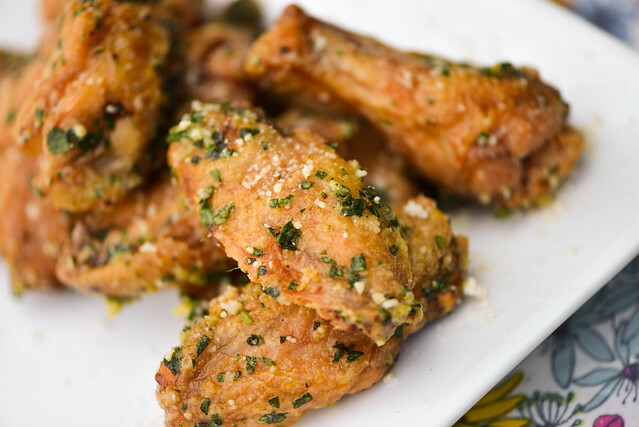 Still, I don't think I could ever stop variating on these crown jewels of finger foods and have so many more tasty incarnations to share, like these garlic and parmesan wings. 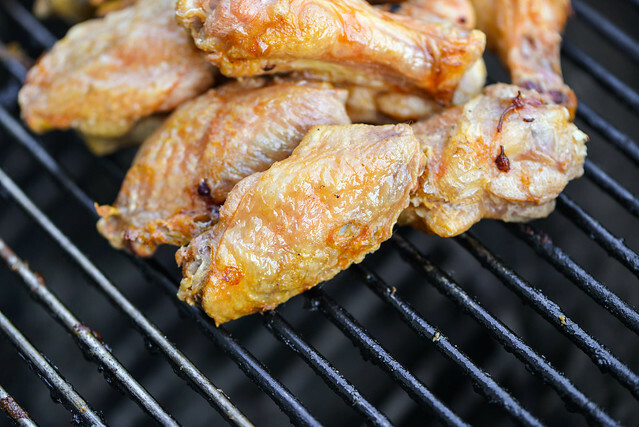 My process to get juicy wings with crackling skin on the grill has been well documented on this blog over and over again. Inevitably just about every recipe this month will follow the same procedure and I figure it best to go over it once again for any newbies out there. Grilled wings can be pretty damn good, by so many fail due to flabby skin when compared to their crispy fried cousins. 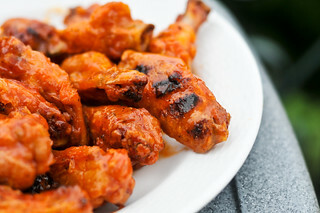 A few years ago my editor Kenji over Serious Eats found a way to get crunchy wings in the oven though, and I've used it ever since without fail on the grill. The "secret" is coating them with baking powder and letting them air dry in the fridge for eight hours in the fridge prior to grilling. The rest in the fridge dries out the skins, so they can more effectively brown and crisp over high heat, while some of the chicken juices absorbed by the baking powder expand when heated, creating a textured skin that's closer to fried chicken, creating the desired blistery texture to give them and enhanced crunch and more sauce holding power. The rest in the fridge may seem long, but it allows ample time for the creation of sauces. In this case, I went with an Italian influence to pair with the primary ingredient of Parmesan. The coating sauce was comprised of extra-virgin olive oil, basil, thyme, red pepper flakes, and black pepper whisked together in a small bowl. After their rest in the fridge, the wings were grilled over high indirect heat. Thanks to the high amount of fat in chicken wings, they can take this type of intense heat and still remain juicy, so I cook my wings for the right texture on the skin rather than internal temperature. When they start to look like this—light golden brown with a crackling skin—they're done. If any aren't quite there yet after about 45 minutes, they can be quickly crisped over direct heat, but be careful because they can burn pretty quickly since most surface moisture is long gone. 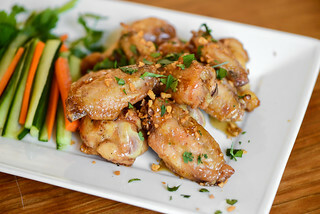 Off the grill, the wings were immediately tossed with the basil and oil sauce while they were pipping hot. The sauce coated the wings entire and created moisture for the Parmesan, which was tossed in next, to cling onto. The wings were now ready for devouring, and they went quickly. The sauce created a pleasing herbal base with a little heat thanks to the red pepper. 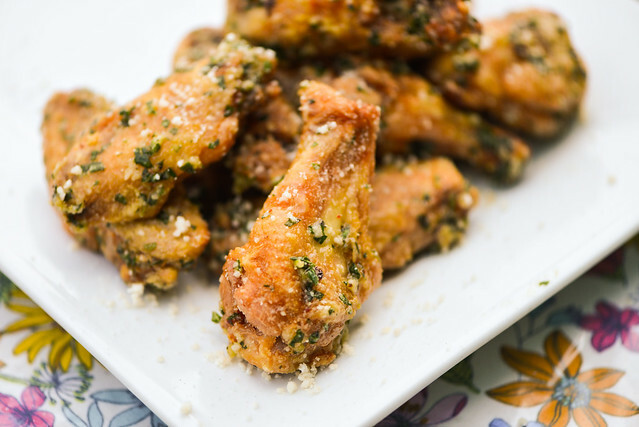 The cheese layer then complimented the basil and oil with a sharp nutty flavor that rounded out wing and made it feel whole and balanced. They were a fitting start for what's going to be a month of recipes that take wings to new great places and will certainly make any Super Bowl shindig more interesting and delicious. Pat chicken wings dry with paper towels. Place wings in a large bowl and sprinkle with baking powder and 1 teaspoon salt, tossing to coat evenly. 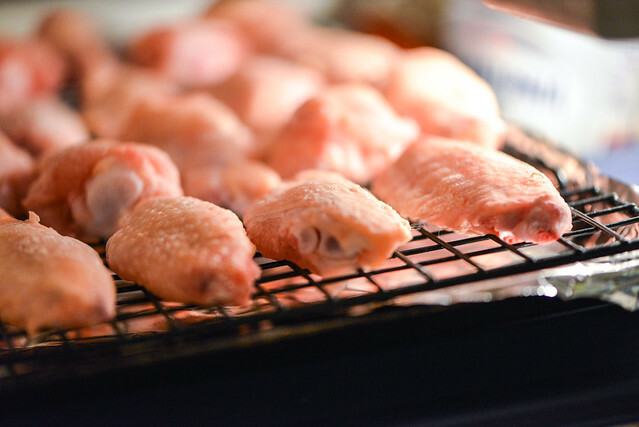 Arrange wings in a single layer on wire rack placed over a baking sheet. Refrigerate uncovered for at least 8 hours. 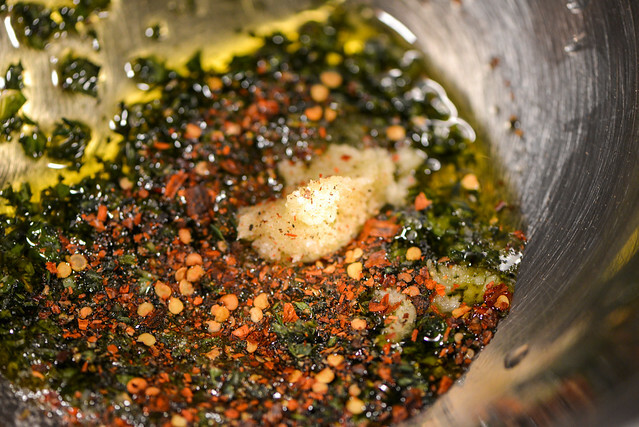 In a large bowl, olive oil, basil, garlic, thyme, black pepper, red pepper flakes, and remaining 1 teaspoon salt. Set aside. Transfer wings to bowl with oil and herb mixture. Toss to combine. 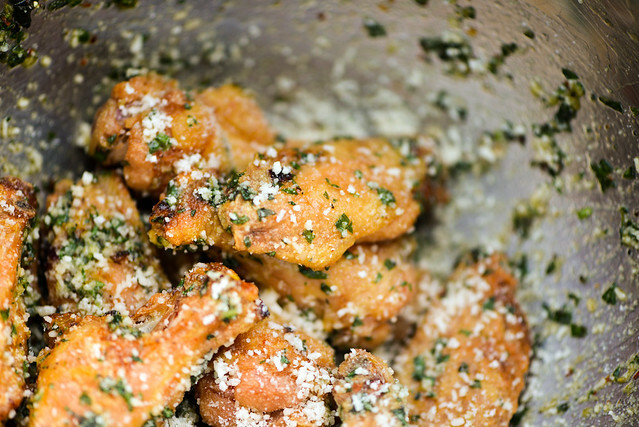 Add in Parmesan cheese and toss again to evenly coat wings in cheese. Transfer to a serving tray and serve immediately. Hey man, I think you're missing the garlic under the Ingredients section. @Josh Thanks for pointing that out, it's in there now. Awesome. Can't wait to try these. Whoa! Those look awesome. Can't wait to give the recipe a try. These look great, and I love the idea of extra crispy skin! I usually let them sit in the fridge overnight as well, but haven't tried the baking soda trick. Is there no residual taste from the baking soda? @Mike Baylus Nope, no off taste that I can discern. Holy moly, That looks great. Tried them. Awesome. Thanks josh. Josh. What works better in this particular recipe? Microplaned fresh Parmesan or the less expensive pre-grated Parmesan? Don't want to waste the good (expensive reggino) stuff if it doesn't really matter. They're chicken wings after all ;) Thanks! @Jason You can use the pre-grated Parmesan, but use decent Parmesan though, not the weird Kraft stuff. What temp (approx) should the grill be when covered? @Dana The grill is usually around 425°F when these start roasting. By the end it may have dropped 25-50 degrees. How would you modify cooking on a gas grill? Made these on a gas Grill 2 weeks ago for tailgating. I wanted to make sure they were done so I baked them the night before for 35 minutes at 400 degrees. I then grilled for 20 minutes at the game. Turned out great. Nice idea! We tried this past weekend doing indirect heat and even though they were technically done temp wise they looked way undercooked and we're not crisp at all. I'll try starting in the oven next time! When you place the wings to the cool side of the grill you cover. Do you mean wrap the wings in foil or foil pan with lid and cook 30-40 minutes or just close the lid to the grill? Thanks!!! @Rob Just close the lid of the grill. Just curious. Can I deep fry these instead of putting them on a grill? @Robert Yes, but you don't need the baking powder/salt rub if you're frying. I'd suggest using this method if you're frying. Baking soda or baking powder? I see both mentioned. Which is it.? I've seen soda used before to crisp a whole grilled chicken. @Steve It's baking powder. Corrected the one mis-reference to baking soda. I tried it and tossed it in the trash. Tasted terrible. Made these for dinner tonight! By far one of the best methods I've ever tried! Will definitely be making these more often. Thank you for sharing!! Can you do them in the oven and achieve the same effect? Will corn starch work instead of baking powder? Nice recipe. I left the wings in the fridge 12 hours, then cooked them low & slow indirect for 3 hrs at 235 degrees (my normal method for wings). The salt was overwhelming on the first batch so I added 1/2 teaspoon of sugar during the toss on the 2nd batch which made it tolerable for my taste buds. On the flip side, I really appreciated how the meat cooked and the appearance was lovely. So lovely that I was eating them off the grill before the toss. I ate more wings naked than coated. Overall, this is a winner. Great job. I left the wings uncovered overnight after the experience. My Pops once told me " It's damn good yard bird if its good cold the next day". Well, I personally think these wings as per recipe falls in that statement. The skin wasn't as crispy as hot which is to be expected, but the taste was outstanding. Great job Josh! First, I would like to thank you for your recipes! I've tried a couple and they are amazing! %uD83D%uDE0D%uD83D%uDE0D the baking powder tip is everything! Which brings me to my question. I've made the Cajun wings a couple times and they come out amazing, so I was trying the garlic Parmesan ones and I keep running into the same problem. The baking powder and salt for some reason is not dying out the skin. They were in the fridge for 8 hours yesterday and when I pulled them out to cook the powder and salt was almost like a paste in the corner of the bowl and the skin wasn't dry. It worked perfectly each time with the Cajun rub. I patted the chicken dry, the bowl was dry. I removed it all, redried the chicken and did the powder and salt again, this morning it was the same way. What am I doing wrong? Please help! Forget the baking soda and Use BISQUICK!! Also grill initially over the hot coals 4 minutes per side then move to indirect side of grill top up to finish!! 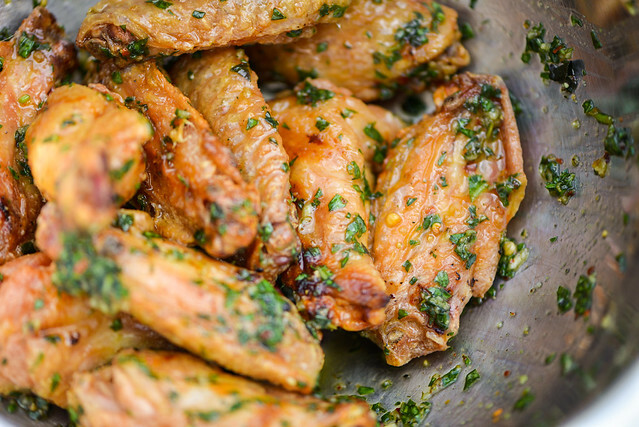 These are our go to recipe for wings. They are amazing! !